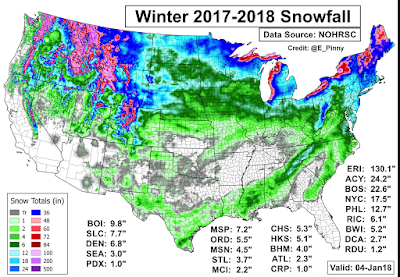 Map of the current season's snowfall. Here in Wichita, it has been 383 days since our last measurable snowfall. We average 16" a year. None is forecast in the immediate future (next four days). The gap is in the heart of the winter wheat belt. Without snow cover, the 2018 crop is vulnerable to, and may have already been damaged by, the extreme cold of the past three weeks. Bill Nye Good! Bill Nye Bad! Sunday Fun: "Best Surprise in the Midwest"
Do You Have a Holiday Gift Certificate? Does a Cold Winter Mean Fewer Summer Insects? Congratulations Phil, Ali, Becky and Justin!